2015 WAS A BANNER YEAR FOR ALL SPECIES OF FISH IN OUR SYSTEM. THERE WERE WAY MORE KINGS THAN IN PREVIOUS YEARS AND WE HAD GOOD FISHING FOR THEM SWINGING GAUDY STREAMERS IN THE TIDEWATER; LOTS OF HOOK-UPS! 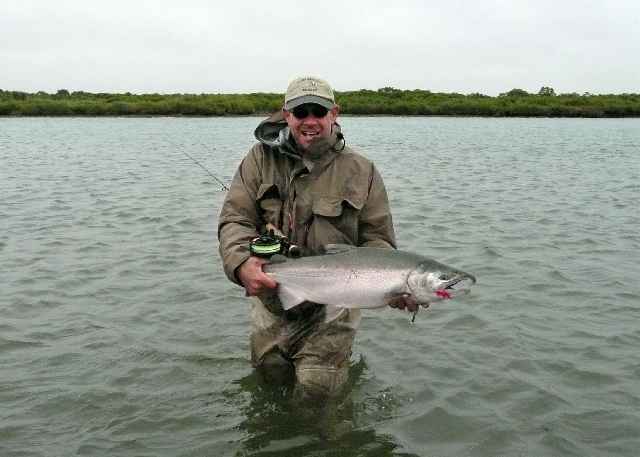 THERE WERE HUGE NUMBERS OF CHROME BRIGHT CHUMS AS USUAL - STARTING IN WITH THE KINGS IN LATE JUNE THEY ARE AGGRESSIVE AND TONS OF FUN AS THEY TEND TO SCHOOL IN VERY SHALLOW , EASILY WADEABLE WATER, AND TAKE FLIES AGGRESSIVLY. 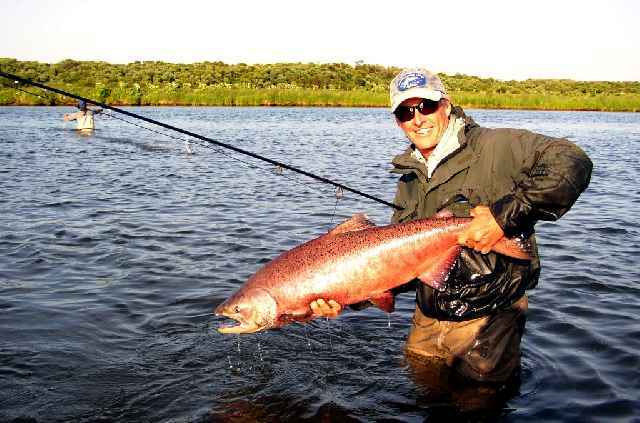 A CHROME CHUM IS, POUND FOR POUND, THE STRONGEST SALMON THERE IS. 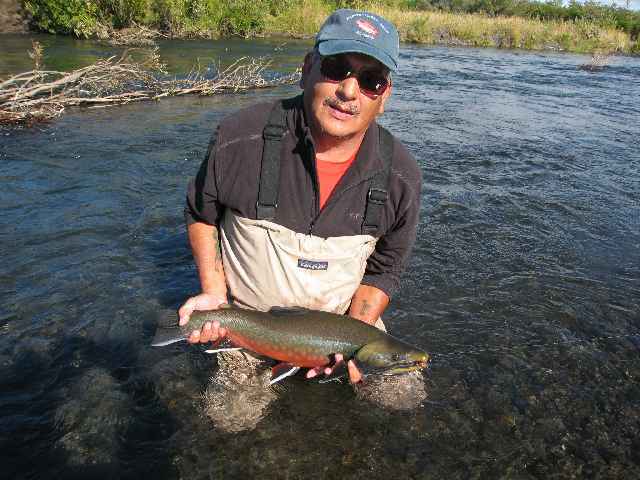 THE DRY FLY FISHING FOR TROPHY CHAR HAS BEEN OFF THE CHARTS THE PAST FEW YEARS. 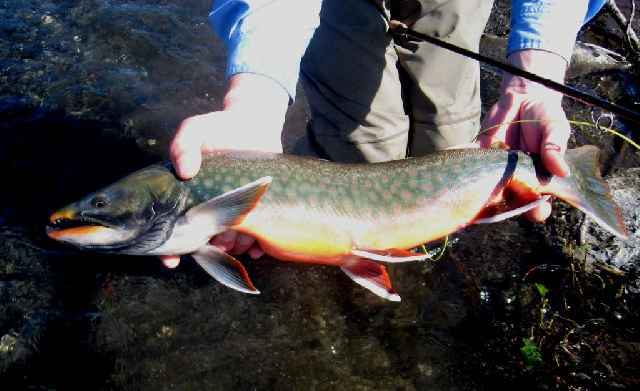 GOOD HATCHES OF GOLDEN STONES, GREEN AND BROWN MAYFLIES, CADDIS AND OTHER BUGS PRODUCE RISING FISH ALL SEASON. ALL SORTS OF DIFFERENT WAKING FLIES ALWAYS PRODUCE LOTS OF ACTION - ESPECIALLY THE "WONDER FLY". THERE HAS BEEN AN INFESTATION OF NORTHERN RED-BACK VOLES STATEWIDE THE PAST FEW YEARS SO NEEDLESS TO SAY A VARIETY OF RODENT PATTERNS WORK GREAT AND PRODUCE BIG STRIKES! SILVERS - WHAT'S NOT TO LOVE ABOUT THEM - AGGRESSIVE AND AIRBORN SUMS IT UP. OUR SYSTEM HAS A HUGE RUN STARTING MID AUGUST AND LASTING THROUGH SEPTEMBER. POPPERS, STREAMERS, PRETTY MUCH ANYTHING WORKS. THE NUMBERS ARE AMAZING ....... MANY TIMES WE SNAP THE POING OF THE HOOK TO MAKE IT EASIER TO RELEASE THEM. 2016 IS SHAPING UP TO BE A REPEAT - WE HAVE AN AMAZINGLY PRODUCTIVE FISHERY. 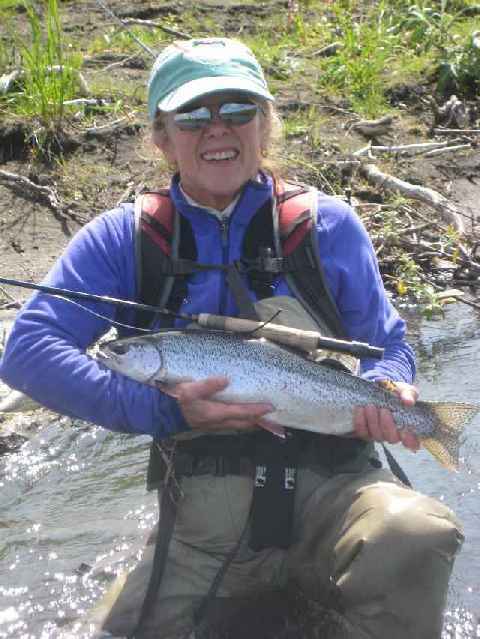 WE HAVE ALSO ADDED SOME OPTIONAL FLY-OUTS TO NEARBY DESTINATIONS INCLUDING ONE WITH POTENTIAL BIG BOWS, AND ONE OF THE BEST PACIFIC SILVER STREAMS IN THE STATE. 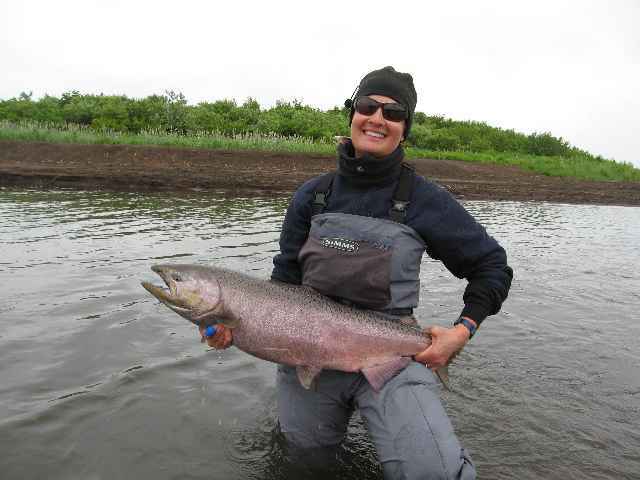 BEST OF ALL HOWEVER IS THE TOTAL LACK OF OTHER FOLKS ON THE SYSTEM - WE BELIEVE THAT A HUGE PART AN ALASKAN FISHING TRIP IS ABOUT HAVING A STREAM ALL TO YOURSELF. JOIN US AND DISCOVER A LITTLE SLICE OF PARADISE! The fishing is a little slow right now, in fact, you can call it glacial.